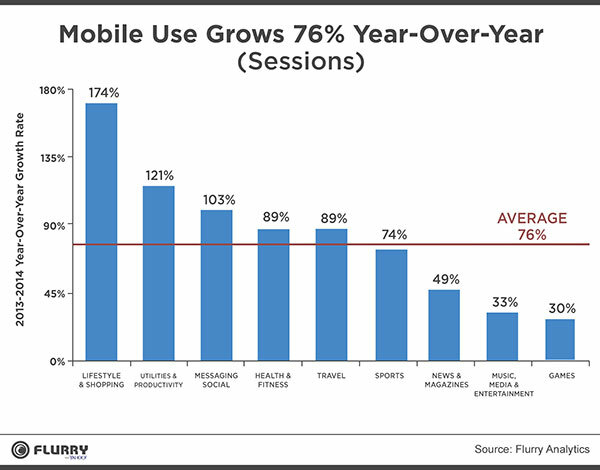 One of the leading mobile app analytics companies, Flurry, released their annual mobile app growth report with some interesting data showing how audiences are changing the way they engage with mobile applications. Overall, mobile app usage grew 76% in 2014, and the top app categories included: “Lifestyle & Shopping,” growing 174%; “Utilities & Productivity,” growing 121%; “Messaging & Social,” growing 89%; and “Health & Fitness” and “Travel” categories, both growing 89% year over year. Compared to last year’s report, “Messaging & Social” and “Utilities & Productivity” still reigned in the top two verticals. 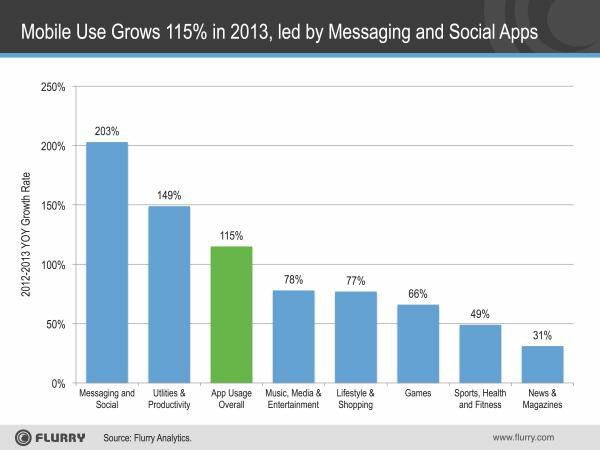 What’s interesting is that the 2014 app categories that grew faster tended to be those with more complex tasks, rather than those with more simple tasks like gaming and consuming passive music and news media. One could draw the conclusion that this shows a maturation of mobile users and app experiences in the market; people aren’t just using apps for games and simple tasks anymore. They’re managing more of their life and more complex and sensitive tasks, such as buying things, booking and planning vacations, and managing their personal health information through mobile applications. They’re becoming more ‘mobile first,’ to use an industry buzzword that describes the inclination to use mobile devices as the first experience with digital content, rather than desktops. As this shift happens, government agencies should prepare their digital app and Web experiences to be robust, full-quality experiences to serve these new mobile-driven audiences who expect full-service, secure, stable and easily usable mobile experiences. Imagine doing your taxes—all on your mobile phone (now you can only check your tax refund status). That might be the most complex possible example, but in the future mobile-first or mobile-only audiences may start to expect it. Our government agencies should start preparing and planning for that future, offering more full-service, complex and secure tasks over smaller, mobile interfaces. Join the MobileGov Community of Practice and help build an anytime, anywhere government future.